All products on this page have been superceded or otherwise discontinued. Information here is for reference only. Adding storage enables you to store your excess renewable energy and use it at the time of your choice. 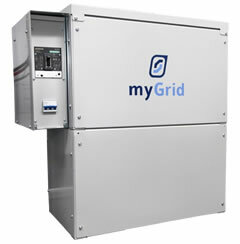 Regardless of whether you have an existing solar power system or require a new system, the myGrid kits can be easily integrated to allow you to immediately take control of your energy usage. Generator Interactive Inverters providing mains quality power efficiently and automatically. 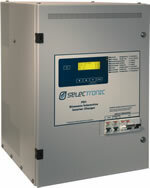 Single Phase RAPS, now available only in 15 kW model. 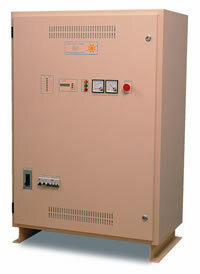 Three Phase RAPS, available in 20kW, 30kW or 40kW models. Single and three phase from 3 kW to 40 kW. For information only. A 1200W continuous inverter, that can run on either 12 or 24 Volts and an energy management system. With many of the features of the SA21, but capable of 2200W or 3000W. A true tine wave inverter with a 2000W continuous rating at 25°C, and a 6000W surge. The SE22, SE32 and SE42 range of sine wave power inverters. This inverter will operate on either 12V DC (at 1300W) or 24V DC (at 1600W). Ideal for boating, caravanning, holiday homes, remote homes. The 24V DC, 2400W continuous inverter can supply up to 7000W surge. Ideal for boating, caravanning, remote homes, industrial. The largest in its family, this 48V power inverter can continuously supply 3600W with a huge surge of 10,000W. These three inverters are also upgradable with Energy Management Mk II. The SA22, SA32 and SA42 range of sine wave power inverters all include our Energy Management Mk II, and now a keypad and 3 shunts at no extra cost. or 24V DC (at 1600W). The Energy Management Mk II has the ability to read, log, regulate and control your system from either the front panel of your SA inverter, a remote keypad, or remote computer, via a phone line and modem. Selectronic offers a range of Standalone Inverters for Off-grid / Leisure power systems where a separate battery charging source is already installed and an additional charging function by the inverter is not required. Camping and caravanning is great. Unfortunately, you can't plug your 240V gear into a tree. With four models to choose from in the LD series, there's sure to be one just right for your needs. These compact True Sine Wave power inverters are great when you want 240V mains style power in a situation where mains power is otherwise not available. The LD series features our Thermal Share Technology (TST). A compact 350 Watt True Sine Wave DC-AC power inverter, the SE10 can provide you with mains style electricity wherever you are. Available in 12V or 24V models. More power than the SE10 Series, but still compact. Models available in 12V at 600W or 24V at 700W. This series of wall mount inverters includes WM1400-12 & WM1700-24 inverters, each also featuring our Thermal Share Technology (TST). Ideal for boating, caravanning, holiday homes, remote homes and industrial applications. A high performance, low cost regulator to suit Selectronic SA22, SA32 and SA42 inverters. A highly versatile AC Synchronous Relay, the SYR15 can be used to switch a variety of 240V loads. Features include solid state and zero crossing switching. Discontinued as of January 1, 1999. The SPI 600-12SS is rated at 620W, and the SPI 600-24SS at 660W. Introduced to meet the demand for a realistically rated, competitively priced inverter from a 12V or 24V battery, the SPI 1200-12SS is rated at 1200W and the SPI 1500-24SS is rated at 1500W.